Confidence and initiative are essential for running a successful theatre company. 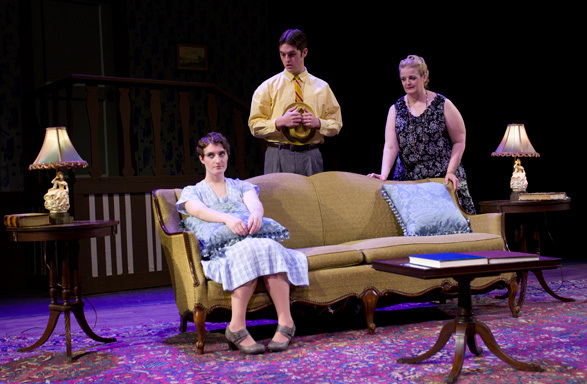 BJU’s master’s program in theatre combines both classroom theory with practical theatre experience to equip you with the knowledge and skill to manage your own theatre troupe. You’ll experience theatre from a Christian worldview—a rarity on a graduate level—so you can learn to weave a Christian worldview into your productions and grow in your passion to share truth through the medium of theatre. Prospective graduate students must successfully pass the graduate platform requirements. Those who lack an undergraduate degree in theatre must have at least 15–18 hours of theatre classes; pass the graduate platform requirements; and make up any deficiencies as a postgraduate special student before proceeding with their graduate work. Learn more. Combined with your passion for excellent theatre from a Christian worldview, the experience you’ll gain from BJU’s master’s program in theatre arts equips you with the knowledge and skill to produce professional-level plays on your own. The program is highly collaborative and entrepreneurial, as you’ll work with your peers to create low-cost, compelling theatre productions. You’ll learn the business side of theatre: how to find an audience and venue, how to keep within a tight budget, how to market your production, and how to problem-solve in any situation. You’ll also learn how new plays are the lifeblood of theatre. That’s why the focus of your program will be to develop two new plays that contribute to the field of independent arts. You’ll learn how theatre interacts with its audience in both cultural and historical contexts, and specifically what the nature of Christian theatre is, and how to apply it to the context of the present culture. In addition, you’ll have opportunities to observe and participate in local performances. BJU offers world-class productions that you can get involved in, from Shakespeare’s famous plays to other famous works, such as Edmond Rostand’s Cyrano de Bergerac and Jane Austen’s Pride and Prejudice. There’s also a large cohort of active theatres in the area that you can explore and network with during your time at BJU. Your faculty bring to their classes many years of teaching experience as well as experience in the theatre and communication fields. Many of them are heavily involved—through acting, designing, directing and more—in BJU’s operas, plays and other productions. They’ll give you plenty of feedback so you can get an honest appraisal of your work to help you achieve your greatest potential. Nearly every semester students can get involved in a Shakespeare production. There are usually many acting roles open to students, including understudy positions for the lead roles, so you can learn from your faculty members on the job. You’ll also have numerous opportunities to collaborate with fellow theatre arts majors on student-run productions, similar to the recent productions of Our Town and Sherlock Holmes. For Living Gallery a team of talented artists and technicians spends hundreds of hours putting together the sets, costumes, makeup and lighting needed to create larger-than-life artwork. In addition, an original drama ties in contemporary spiritual struggles to the overarching theme of the artwork. Articulate and apply essential theories of theatre and performance to both analytical and creative projects. Acquire the following collaborative core-competencies: analysis, writing/adaptation, directing, design/stagecraft, and performance. Create and assess an original, applied, mission-driven theatre project for a local community.